36 weeks: A big ole melon! Bambino’s a big ole melon now! And I feel it! 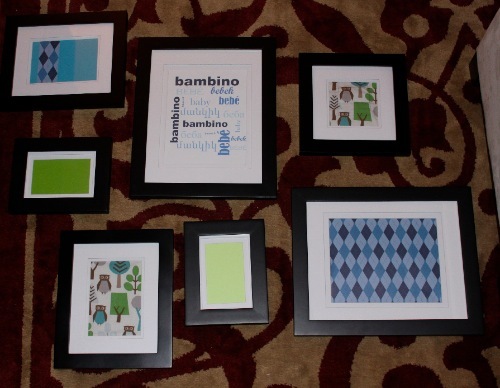 We are going to hang these frames above the changing table, and then switch out the basic frames for photos and other unique pieces as we patiently find them. I want to find a vintage colorful world map for the bottom right frame, and I’m unsure about the others. Where should I check besides Etsy? And aside from the list of last minute tasks, I want to be sure to spend as much time on dates with my husband: life’s about to change. If I’m being honest, I’m frightened about it all. I am equally excited to be done with living in a foreign body as I am to meet my son. 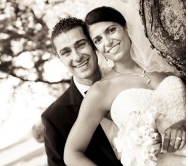 When I was getting married and our wedding date approached, I had many freak out moments where I panicked. I knew life was about to change, and despite being excited and in love, I was afraid. I’m someone who adapts to change very easily, but until that change happens, I panic. I think that’s why I am so organized and full of lists with these big things- it helps me feel in control. As I approach the day where we finally meet the little guy, the pain of missing my mom grows. I feel so thankful to have strong women in my life- my mother in law, my auntie, and my nonna- but I still feel my mom’s absence tremendously. I only hope that I can channel her as I become a mom myself. I wish she was here to be with me through all this. New topic before I cry through the rest of this post…. Last week I could not wait for our doctor’s appointment. It went really well! This might be too much information, but the baby’s head is locked into position, and my body is slowly getting ready for labor. No actual values yet, but it’s on its way there. I’m not sure if I will have any more checks of that sort until labor- we will see- but it is encouraging to know that my body is doing everything right. When we had the miscarriage last fall I became afraid that something was wrong with my body, and it is really comforting to know that in every step of this pregnancy it is doing the right thing. Your baby is still packing on the pounds — at the rate of about an ounce a day. She now weighs almost 6 pounds (like a crenshaw melon) and is more than 18 1/2 inches long. She’s shedding most of the downy covering of hair that covered her body as well as the vernix caseosa, the waxy substance that covered and protected her skin during her nine-month amniotic bath. Your baby swallows both of these substances, along with other secretions, resulting in a blackish mixture, called meconium, will form the contents of her first bowel movement. At the end of this week, your baby will be considered full-term. (Full-term is 37 to 42 weeks; babies born before 37 weeks are pre-term and those born after 42 are post-term.) Most likely she’s in a head-down position. But if she isn’t, your practitioner may suggest scheduling an “external cephalic version,” which is a fancy way of saying she’ll try to coax your baby into a head-down position by manipulating her from the outside of your belly. Pregnancy is really weird. For the first trimester I could only drink bottled water, and even then I needed to have lemon or something in it. Now I drink tap water (not even filtered) but it must have tons of ice. Our ice machine is constantly running because I really load up my glass. HEARTBURN– Please help me. More details in my request for help, but I’m suffering big time. SLEEP- I’m not really sleeping anymore, but it’s ok because I have been able to rest a bit more in the afternoons. STRETCH MARKS- I took a magnifying mirror to my belly the other day to check them out since my belly has dropped so much that they are somewhat hiding. It’s getting ugly. I hope that they fade fast and have been much more diligent about applying Bio-Oil. I’m back to exercising again and it feels good. Yesterday I walked a lot. I had tons of contractions, but it was still nice to be moving and have the sun on my face. I didn’t talk about it much, but around 26 weeks when I had the pre-term contractions I ended up stopping exercise completely. It was hard and I’m happy that that period is over. Last thought… exercise balls are made for uncomfortable pregnant women. I might look funny, but it feels so good to bounce and roll around on the ball. Almost every night while we watch TV I hop on the ball and it relaxes me. Somehow it makes the Braxton Hicks contractions easier to handle, and it makes my back and sciatic nerve pain lessen. Try it! Weight gain in the last week: I think I’m done with the scale. As of 35 weeks I had gained 36 lbs, so I assume I will end up somewhere around 40. This close to the finish line I just don’t care anymore as there is nothing I would do to change my diet. I might change my mind next week, but for this week the scale has been untouched. Days before maternity leave: 2. I am still going to work a few hours each day until labor, but without the pressure of having to work. I need to be able to finish up my to do lists and to rest when needed at this point. Current cravings: Rather than craving one food like mad, I have had very specific cravings that I had to satisfy throughout the week. One day it was a gyro, another day it was an iceberg lettuce salad with lemon juice and olive oil. Quite random. I really, really want a Boston creme donut, and I might just go and find myself one this week. Middle of the night visits to the restroom: on average 6. And yes I counted. Those are the types of things you do when you get up a lot in the night. Times PB helped me get up from the couch or out of the car: 4-6. Nights I thought I was in labor: 7. Every single night, like clockwork, my body acts up. Painful punches from bambino that made me cry: 1, and then PB had to physically push his body out of the way. Didn’t think it would be possible, but it worked. Times PB & I look at one another with an excited, knowing smile at the adventure ahead: Millions. I am so excited for you!! How exciting ! Just a few more weeks to go, hang in there! YES! The yoga ball is amazing! I wish I could work with it on my kitchen table but it is too low! I am only getting up twice during the night but this might change. Heartburn you say? I am popping TUMS like noones business, but I have also done 1 Tbsp of apple cider vinegar in a tall glass of water. The frames for your decorations look great. I am having a hard time arranging with 1 1/2 walls we only have available in our office/nursery. Hang in there! You look awesome! You look great! It is getting so close! So exciting!!! Love the last line the most! “Times PB and I…” too cute 🙂 You’re doing great girl. Almost there!! You’re totally going to have your bambino before I have baby d! I still feel great – just huge- and am convinced nothing is going on. And now I’m worried because baby d is posterior and I’m afraid it will not allow me to go au natural … ah stress! But either way, I’m so ready. 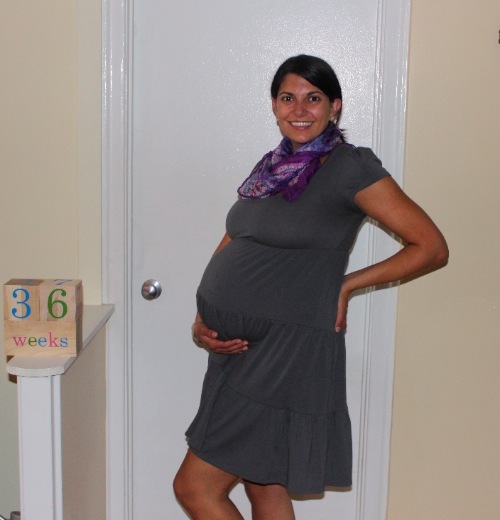 I was ready at 36 weeks, but here I am 3 weeks later… still waiting. Hoping it comes more quickly for you! um, if i’m already going to the bathroom x 3 NOW what does that mean for tri #3!?!?!? You look great! I have a suggestion for the heartburn – when I was in college I had horrible acid reflux, like so bad it gave me a chronic cough and I had to be on prescription medicine like a 60 year old fat man. Anyway, it has mostly gone away but I still get it sometimes and the major thing that helps me is a little bit of baking soda in a glass of water. There are actually directions for this on the side. Have you tried that? Also, deep breaths, and try to move the air down your throat/chest/I am sure there is a more technical term for that part of your body. Hope that makes sense. Anyway, I have no idea if baking soda is allowed for pregnant people, but if it is I’d give it a try. Good luck! Aw the last sentence is really cute, it must be such a crazy mix of emotions I cant even imagine. It’s so normal to feel this way right now. Your hormones are out of control, you don’t feel like you, and everything is about to change. Just rely on all of the wonderful support around you. Enjoy your time right now, and remember to take care of yourself!!! Also, I craved super icy water in the end too. I almost broke our ice machine on the fridge several times. The colder the better! I’m a new reader as well, so nice to have found you. I too have lost my Mom, 10 years ago, and still have a good cry every now and then. I appreciate your honesty, and take comfort in hearing you share your thoughts and emotions. It helps to know other motherless daughters are out there. Your mother is with you now, more than you know. Good luck with the new baby coming! Exciting!!!!! So, I read something on one of my pregnancy apps today and thought of you. Natural remedies for heartburn! Very ripe papaya, almonds, and a tablespoon of honey in warm milk. You look great! And I completely understand about your panics! It’s hard to know exactly what it’s going to be like with a baby in your life! You are almost there! I agree, eat out often now, get a pedicure, get your hair cut, pamper yourself! Not because you won’t be able anymore but you won’t even care to the same way. You will be so focused on the little one! (This will change a little bit once he gets a little bigger. 🙂 But enjoy this preparation time! So much fun! So close! With our frames, I just printed out prints of old storybook illustrations that are past copyright. (e.g. Alice in Wonderland) Yours already look really cute! As for heartburn, I didn’t find solutions, but, oh, I can sympathize with your pain. I was DOWNING Tums on top of Zantac, and had to sit in very specific positions so that I wouldn’t get sick. Like I did in the middle of a yoga class. Ugh. Good luck! Keep Bambino cooking a little longer but yoga squats are the position I lived in the last few weeks! Yeay you’re so close! I found that hanging out on all fours was awesome. I put a pillow under my knees and I would put my head on the counch and rock from side to side. It helped with hip and sciatic pain. I did it for at least an hour every day in the final three weeks of my pregnancy. a) you look amazing and so cute, don’t let the scale bother you in the least. b) thank you for all the great tips of the trade. you make me really excited for eventually starting a family some day 🙂 🙂 i will absolutely keep all these tips and tricks in mind. c) congrats again, a million times over! Aloe Vera juice is AMAZING for heartburn. I’ve seen it at Walgreens, but you can also buy it in concentrated bottles at the health store and dilute it with a little water, juice or tea. It has a slightly citrus flavor. The best thing is that it actually heals your throat instead of simply coating your throat. Out here in the southwest, we use aloe vera pulp on sunburns AND any other kind of burn to heal and soothe so it makes sense that the consumed juice would heal and soothe your esophogus. Oh darling I can totally relate to feeling a bit panicky. My little boy is about to turn 6 months old in 4 days and I still pinch myself and go whoa, I am a mum! I am really excited for you both for this exciting and sometimes challenging time. Oh btw I had the ice cravings in 3rd trimester and even was begging for ice chips all through labour. Couldn’t get enough. So many people told me it was iron deficiency but I am not sure.